The very last time my beloved New York Knicks were in the NBA Finals was sometime in 2003. For context, this was a huge deal because they had been dating for nine days. For more context, this was a huge deal because the big office event fell on Day Number 10, the day when Andie was supposed to ditch Ben as part of her magazine assignment: how to lose a guy in 10 days, the title of the rom-com masterpiece How to Lose a Guy in 10 Days. For more, more context, this was a huge deal because Ben needed to bring Andie to the big office event as part of a bet to win an agency pitch: make a woman fall in love with him in 10 days. “Listen, don’t make any plans for Day 13, because…we have a game to go to,” Ben told Andie, which in basketball love language, has the same weight as getting down on one knee and proposing marriage. It was the movie’s most romantic quote. He whipped out, from the back pocket of his tight jeans, two tickets to an NBA game at Madison Square Garden. And not just any NBA game. It’s Game 7 of the NBA Finals between the New York Knicks and the Sacramento Kings. It was a huge deal. Andie gave Ben a tight hug and it was at this point in the movie when you knew she had fallen in love with him. She scrunched her eyebrows, her daze wandering off as they hug, giving a look that said, 1) Oh crap, I’ve fallen in love with this guy, and 2) The Knicks are so going to lose this game. The NBA Finals was brought up in the very first scene, with Andie declaring to an officemate that she had tickets to the “most exhilarating and artistic display of athletic competition known to mankind,” which was a way of saying she’s a fan of the Knicks and not of the game of basketball as a whole. On Ben’s beer-and-sneakers side of the advertising fence, he declared to an officemate that the “Knickerbockers are in the championship series,” which was an odd thing to say for a Knicks fan, which I know Ben was, based on the framed Allan Houston jersey in his office. At this point, you must be saying: ENOUGH ABOUT BEN AND ANDIE, HOW THE HELL DID THE KNICKS AND THE KINGS MAKE THE FINALS IN ’03?! Well, I was getting to that and you didn’t have to shout. The real world Kings were dominant in the West, winning 59 games and making it to the Western Conference Semis before losing to the Dallas Mavericks. The Kings actually had a shot at making it to the Finals with a lineup of Chris Webber, Mike Bibby, Vlade Divac, Bobby Jackson, and Peja Stojakovic. The real world Knicks were bad in ’03, missing the Playoffs for the second consecutive year after making it to the Finals in ’99. Jeff Van Gundy had moved on and left the coaching duties to Don Chaney. 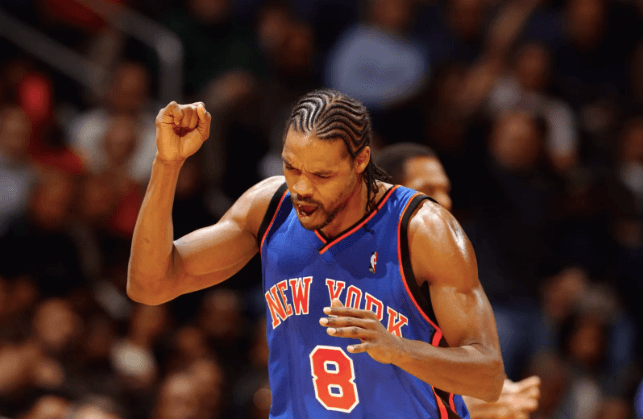 Larry Johnson was gone and the scoring was left to the hands of Latrell Sprewell (16ppg) and Allan Houston (23ppg). So, yeah, a Knicks and Kings Finals matchup happening was as likely as Andie, the delegated how-to girl, getting her How To Bring Peace To Tajikistan piece published on Composure. Game 1 was close, with the Knicks down 72-74 with 6:24 left in the third quarter. Game 1 was also weird, with Kurt Thomas hacking Scot Pollard but the foul was inexplicably called on Houston. By the fourth quarter, the game was still close, with the Knicks up two points, 93-91. A glimpse of the MSG scoreboard revealed eye-popping numbers: Sprewell has 42 points; Kurt Thomas has 21; while Houston has 14 pts. For the Kings, Bibby led with 33 while Bobby Jackson chipped in 22. Oddly, in the HTLAGI10D universe, Webber doesn’t exist. The Kings were up a point in the closing seconds when Sprewell hit a game-winning jumper, which Ben failed to see because he was busy buying Diet Coke (no ice) for Andie. Game 2 also went down the wire, but Houston missed a jumper from the top of the key (which he never misses, as pointed out by Ben), allowing Jackson to win it for the Kings (via an Earl Monroe move, as called by Marv Albert). Ben missed the exciting game yet again, because Andie decided, after being served what looked like a perfectly cooked rack of lamb with cherry glaze, that she didn’t eat meat. They had to eat out in a restaurant that didn’t have a TV, except in the kitchen, where Andie snuck to watch the final seconds. The first two games were ridiculously close and entertaining, yet somehow people in the movie decided to talk about Games 3, 4, 5, and 6 ZERO times. Did they forget that the freaking Knicks were back in the Finals? If you’ve seen How to Lose a Guy in 10 Days, then you’d know that Ben and Andie didn’t make it to Day 13, which meant they didn’t get to watch Game 7 at Madison Square Garden, which meant fans of both rom-coms and basketball were robbed of a Game 7 where Ben was likely to pull off a grand gesture like a proposal at mid-court or a flash mob to express his love to Andie. This was the movie’s lowest point: two Game 7 tickets, unused. Andie had the game on at a friend’s apartment, but wasn’t really watching. Ben, talking to a dog, didn’t even want to watch. “You wanna go? You wanna go to the game? Go ahead…because I’m not going,” Ben said to a Chinese Crested. Little did he know, that would be the last time the Knicks would be in the NBA Finals. Spoiler alert: Ben and Andie did end up together, but we’ll never find out if the Knicks won the championship that year, and I think about that a lot. If the Knicks lost, then Andie would have submitted her Pulitzer prize-winning article: How to Lose in the NBA Finals in 7 Games. If the Knicks won, then the piece would have been: How to Win in the NBA Finals Without Ewing. So many lost storylines will never be uncovered. I might have re-watched How to Lose a Guy in 10 Days more than 20 times already that by now, I’ve memorized all the lines and nitpicked all the scenes. That said, I think I’ve had enough and I’ll probably never watch this movie ever again.